Posted on August 28, 2017 at 1:27 am. The biggest fight of the year between Conor McGregor and Floyd Mayweather attracted big bets and a lot of social media attention over the weekend. One of the best tweets was from Verne Troyer, the actor who played Mini-Me in Austin Powers and the ambassador for BGO online casino. 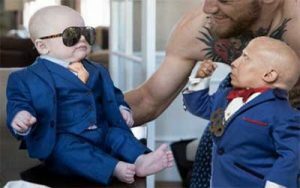 After McGregor posted a picture of his son dressed up in a navy blue suit, Troyer jumped at the opportunity to point out the similarities. “Me and @TheNotoriousMMA’s son bout to have the fight of the century” Troyer wrote in his post, featuring the BGO gold medallion. The hilarious tweet which shows Troyer squaring up to Conor Junior was shared 5000 times and was a much-needed post amongst the hostile and aggressive tweets. Troyer is known for making hilarious advertisements to promote one of the biggest online casinos on the web. He acts as the ‘boss’ for BGO and challenges players to beat him. You can find out more by reading our review here. Paris Hilton and other well-known celebrities have been featured in ads for the online casino, which offers $150 when you make your first deposit of $30. Bookmakers would have lost a lot of money had McGregor won the fight, which could be why one popular betting site was feeling the heat. Irish-based bookie, Paddy Power, posted a controversial tweet over the weekend which it has been forced to defend. The bookie tweeted punters to “always bet on black” in support of Mayweather and posted promotional material featuring the tag line. Tweeters replied slamming the post and labelling it racist. Users said they’d be unfollowing and deleting the app. “Like Wesley Snipes, Floyd Mayweather is rightfully proud of his identity and yes the advert does certainly reference his race – but it does so in a manner which we would not consider in any way derogatory or insulting,” he said. “But more to the point, it is also a statement of fact. Paddy Power often uses controversial marketing tactics but many believe the betting company has gone too far. As it did with Mayweather, Paddy Power paid out early on in the presidential campaign for Clinton bets. But the elections results caused an upset for the betting company. Paddy Power got it right this time though, with 80 percent of the bets going on McGregor. “Patriotism aside, we are paying out early on a Mayweather victory… because we checked, and only one of them is a boxer,” said a spokesperson.